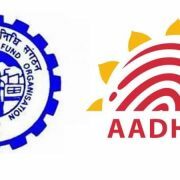 ?In case, the earlier UAN was Aadhaar seeded and verified, the declaration by the employer of transfer request made by the employee in Form-11 will trigger an auto transfer process which will transfer the accumulations against his previous PF ID to the new PF ID. ?Form No. 13 is not required to be submitted in such cases.